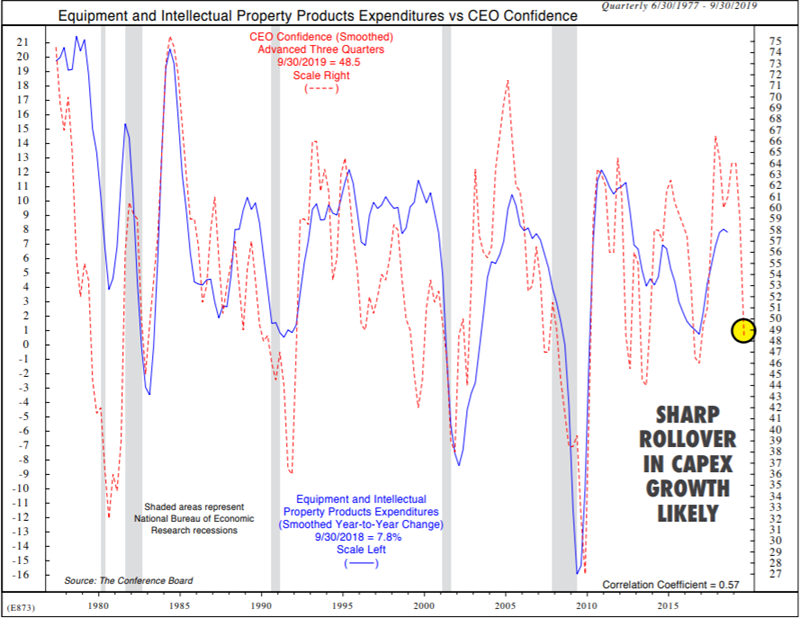 There’s reason to expect the downward pressure on capital expenditures to continue. For a brief, shining moment, it looked as if American corporations had learned to invest again. Following the passage of the late-2017 corporate tax reform, U.S. companies rushed to pour money into spending related to investing in research and development, new projects and equipment. So-called capital expenditures, or capex, rose 10.1% in the first half of 2018, more than double the 4.1% increase seen in the six months prior. 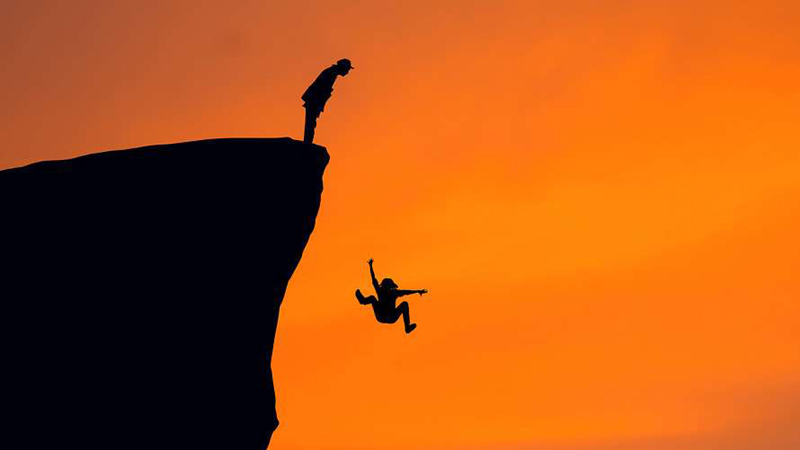 However, since then it has sputtered, rising a comparatively meager 2.5% in the third quarter, and there’s reason to expect this downtrend to continue, according to Veneta Dimitrova, senior U.S. economist at Ned Davis Research Group. The analysts said recent surveys on the business outlook paint a unfavorable picture that could spell further drops in corporate investments and possibly an economic retrenchment, a despite a jolt from tax cuts 13 months ago. Dimitrova points to the Conference Board’s CEO Confidence index, which fell from a reading of 55 in December to 43 in January — its lowest reading since the third quarter of 2012. 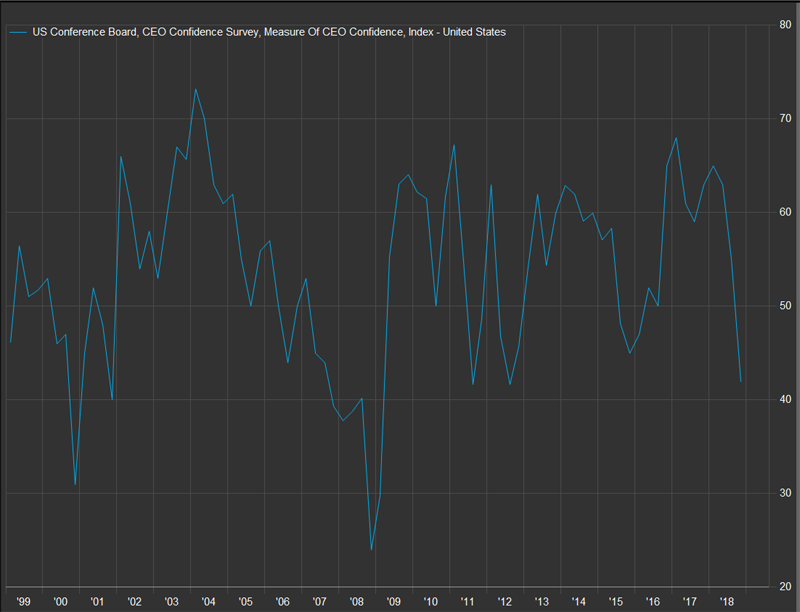 The trend in CEO confidence is troubling, as there have only been 10 other instances since 1976 when CEO confidence has fallen to 43 or lower, and in the median case, business investment has declined 4.8% four quarters later. In abut 40% of instances, the low level of confidence coincided with a recession. Other ominous survey data include a popular survey from Duke’s Fuqua School of Business, in which respondents predicted just 1% growth in capex over the next year, the lowest level since 2016 and the second-lowest since 2009. Meanwhile, the National Federation of Independent Businesses survey showed small business owners’ capex spending plans fell to their lowest level since before the 2016 presidential election. These data dovetail with a survey released Monday by the National Association of Business Economists, which showed that 84% of companies reported that the tax law didn’t cause them to increase their capital spending programs.